Scotland's World Cup qualification hopes took another massive dent as they were held to a draw by Moldova. The Scots had the better of the first half but they found themselves a goal down in 28 minutes when Serghei Dadu swivelled and scored from six yards. Steven Thompson equalised three minutes later with a shot through the legs of Moldovan keeper Evghenii Hmaruc. Moldova were on top after the break but Dadu and his team-mates passed up the chances that came their way. Scotland were first on the attack and it was Stevie Crawford who came close to opening the scoring. The striker beat Serghei Lascencov for pace before attempting to catch Hmaruc by surprise with an early shot that flew just over the bar. The bumpy pitch was proving a major challenge to players attempting even the most basic of manouevres, but Barry Ferguson was only inches wide with a low drive from the edge of the box. Scotland had a decent penalty claim turned down midway through the first half when Thompson headed the ball down, only for Crawford to be prevented from latching onto the knock-down as his marker tugged his jersey, but the referee saw nothing amiss. Moldova took the lead with their first effort on goal. Dadu collected Ghenadie Olexici's cross with his back to goal and he was able to turn Gary Caldwell and lash the ball past Craig Gordon. Scotland were soon level though. Darren Fletcher's cross landed at Thompson's feet via the head of a Moldovan defender and the striker knocked the ball through the legs of the goalkeeper. 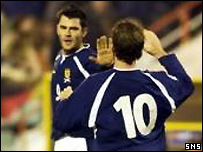 Gordon came to Scotland's rescue right at the start of the second half when he tipped a fierce volley from Dadu round the post. Serghei Covalciuc drove the ball wide from the edge of the box and Iulian Bursuc did likewise as Moldova dominated the opening stages of the second period. Colin Cameron tested Hmaruc from long-range but the keeper was equal to the task. Dadu missed an excellent opportunity after 74 minutes when he headed over the bar from only eight yards out with no Scotland player near him and the same player forced Gordon to look lively from a 20-yard free kick. Crawford hit a tame effort at Hmaruc from a good position before Rogaciov shot wide at the other end when he should have scored. Substitute Lee McCulloch was handed a late debut and tried to beat Hmaruc from distance with a few minutes left, but again the keeper was behind the shot. Moldova: Hmaruc, Savinov, Lascencov, Olexici (Cebotari 39), Catinsus, Priganiuc, Covalciuc, Ivanov, Rogaciov (Miterev 85), Bursuc, Dadu. Subs Not Used: Melenciuc, Andriuta, Golban, Epureanu, Corneencov. Scotland: Gordon, Gary Caldwell, Stephen Caldwell, Webster, Naysmith (Murray 46), Fletcher (Miller 66), Holt, Ferguson, Cameron, Thompson (McCulloch 85), Crawford. Subs Not Used: Marshall, Severin, Hughes, Murty.